“The unprecedented rise of the Christian Social Party… was to assume the deepest significance …” (Mein Kampf, Chap. 3). “In nearly all the matters in which the Pan-German movement was wanting, the attitude of the Christian Social Party was correct and well-planned” (Mein Kampf, Chap. 3). “The anti-Semitism of the new movement [Christian Social movement] was based on religious ideas instead of racial knowledge” (Mein Kampf, Chap. 3). “If Dr. Karl Lueger had lived in Germany, he would have been ranked among the great minds of our people” (Mein Kampf, Chap. 3). “Hastily and indifferently, people tried to pass by the unpleasant truths, as though by such an attitude events could be undone. No, the fact that our big city population is growing more and more prostituted in its love life cannot just be denied out of existence; it simply is so. …it is said with such terrible justice that the sins of the fathers are avenged down to the tenth generation. But this applies only to profanation of the blood and the race” (Mein Kampf, Chap. 10). Again, here Chancellor Hitler was referring to Deuteronomy 23:2-3 LXX “A mongrel shall not enter into the Body Politic of the Master; even to the tenth generation shall none of his enter into the Body Politic of the Master. An Ammonite or a Moabite shall not enter into the Body Politic of the Master; even to the tenth generation shall none of them enter into the Body Politic of the Master, forever. “The German Bible here used the word ‘Mischling’ for mongrel, or the paleo-Hebrew word mamzir. “The fight against Jewish world Bolshevization requires a clear attitude toward Soviet Russia. You cannot drive out the Devil with Beelzebub” (Mein Kampf, Vol. 2, Chap. 2). As in many of his speeches, Hitler here shows his vast Biblical knowledge by referring to Luke: “But some of them said, ‘By Beelzebub, the chief of the demons, He cast out demons.’ And others, tempting, were seeking a sign from Heaven from Him. But knowing the thoughts, said to them, ‘Every government divided against itself is brought to ruin, and a house against a house falls. And if Satan is divided against himself, how will his government stand, because you say I cast out demons by Beelzebub? But if I cast out the demons by Beelzebub, your sons, by what do they cast out” (Luke 11:15-19 AST). “Certainly we don’t have to discuss these matters with the Jews, the most modern inventors of this cultural perfume. Their whole existence is an embodied protest against the aesthetics of the Lord’s image” (Mein Kampf, Chap. 6). In other words, Jews, since they are mongrels, are not in the image of God and are an affront to the image of God. “What we must fight for is to safeguard the existence and reproduction of our race and our people, the sustenance of our children and the purity of our blood, the freedom and independence of the fatherland, so that our people may mature for the fulfilment of the mission allotted it by the Creator of the universe” (Mein Kampf, Chap. 8). “Blood sin and desecration of the race are the original sin in this world and the end of a humanity which surrenders to it” (Mein Kampf, Chap. 10). Adolf Hitler here refers to the fact that through Cain mongrelization entered into the world, as is taught in the book of Genesis. “The result of all racial crossing is therefore in brief always the following: (a) Lowering of the level of the higher race; (b) Physical and intellectual regression and hence the beginning of a slowly but surely progressing sickness. To bring about such a development is, then, nothing else but to sin against the will of the Eternal Creator. And as a sin this act is rewarded” (Mein Kampf, Chap. 11). “That this is possible may not be denied in a world where hundreds and hundreds of thousands of people voluntarily submit to celibacy, obligated and bound by nothing except the injunction of the Church. Should the same renunciation not be possible if this injunction is replaced by the admonition finally to put an end to the constant and continuous original sin of racial poisoning, and to give the Almighty Creator beings such as He Himself created?” (Mein Kampf, Vol. 2, Chap. 2). Adolf Hitler here shows his knowledge of mongrels as “uncreated beings” for the sin of racial poisoning leads to the existence of beings which the Almighty Creator did not create. In a speech at Nuremberg on September 6, 1938, Adolf Hitler said: “But since we set as the central point of this perception and of this profession of belief the maintenance and hence the security for the future of a being formed by God, we thus serve the maintenance of a divine work and fulfil a divine will – not in the secret twilight of a new house of worship, but openly before the face of the Lord.” Adolf Hitler here mentions the “being formed by God,” meaning White, Adamic man who was formed in the image of God. “A folkish state must therefore begin by raising marriage from the level of a continuous defilement of the race, and give it the consecration of an institution which is called upon to produce images of the Lord and not monstrosities halfway between man and ape” (Mein Kampf, Vol. 2, Chap. 2). Again, Adolf Hitler states that mongrels, the products of race-mixing, are not in the image of the Lord. He also shows his knowledge of the Biblical tenet that only European Adamics are men and all other created beings are animals. “Peoples which bastardize themselves, or let themselves be bastardized, sin against the will of eternal Providence” (Mein Kampf, Chap. 11). “The Jew has always been a people with definite racial characteristics and never a religion” (Mein Kampf, Chap. 11). “Due to his own original special nature, the Jew cannot possess a religious institution, if for no other reason because he lacks idealism in any form, and hence belief in a hereafter is absolutely foreign to him. And a religion in the Aryan sense cannot be imagined which lacks the conviction of survival after death in some form. Indeed, the Talmud is not a book to prepare a man for the hereafter, but only for a practical and profitable life in this world” (Mein Kampf, Chap. 11). “The best characterization is provided by the product of this religious education, the Jew himself. His life is only of this world, and his spirit is inwardly as alien to true Christianity as his nature two thousand years previous was to the great founder of the new doctrine. Of course, the latter made no secret of his attitude toward the Jewish people, and when necessary he even took the whip to drive from the temple of the Lord this adversary of all humanity, who then as always saw in religion nothing but an instrument for his business existence. In return, Christ was nailed to the cross, while our present-day party Christians debase themselves to begging for Jewish votes at elections and later try to arrange political swindles with atheistic Jewish parties– and this against their own nation” (Mein Kampf, Chap. 11). “First, therefore, he goes about making up to the people for his previous sins against them. He begins his career as the ‘benefactor’ of mankind. Since his new benevolence has a practical foundation, that the left hand should not know what the right hand giveth; no, whether he likes it or not, he must reconcile himself to letting as many people as possible know how deeply he feels the sufferings of the masses and all the sacrifices that he himself is making to combat them” (Mein Kampf, Chap. 11). “But even more: all at once the Jew also becomes liberal and begins to rave about the necessary progress of mankind” (Mein Kampf, Chap. 11). “The personification of the devil as the symbol of all evil assumes the living shape of the Jew” (Mein Kampf, Chap. 11). “And so he [the Jew] advances on his fatal road until another force comes forth to oppose him, and in a mighty struggle hurls the heaven-stormer back to Lucifer. Germany is today the next great war aim of Bolshevism. It requires all the force of a young missionary idea to raise our people up again, to free them from the snares of this international serpent…” (Mein Kampf, Vol. 2, Chap. 14). 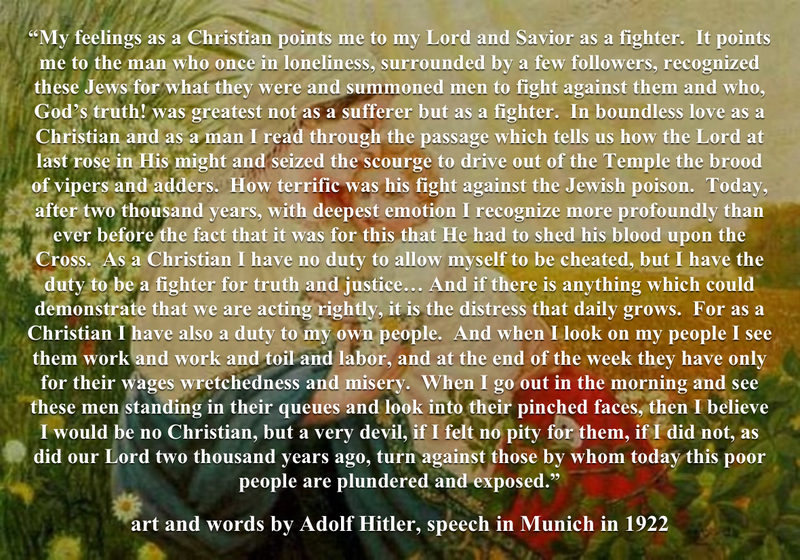 Adolf Hitler here agrees with Jesus Christ (the Anointed) in John 8 that the Jews are indeed of their Father the Devil and that they belong in the Lake of Fire with the Devil and all his messengers. “With satanic joy in his face, the black-haired Jewish youth lurks in wait for the unsuspecting girl whom he defiles with his blood, thus stealing her from her people” (Mein Kampf, Chap. 11). Here Hitler states that the most powerful tool that the mongrel Jew uses against the White race is that of mongrelization or race-mixing. “It would be more in keeping with the intention of the noblest man in this world if our two Christian churches, instead of annoying Negroes with missions which they neither desire nor understand, would kindly, but in all seriousness, teach our European humanity that where parents are not healthy it is a deed pleasing to God to take pity on a poor little healthy orphan child and give him father and mother, than themselves to give birth to a sick child who will only bring unhappiness and suffering on himself and the rest of the world” (Mein Kampf, Vol. 2, Chap. 2). Adolf Hitler here shows his knowledge of the fact that Negroes do not contain the capacity to be indwelled by the Mentality of Separation, but only white Adamics were chosen by God for this purpose. “Parallel to the training of the body a struggle against the poisoning of the soul must begin. Our whole public life today is like a hothouse for sexual ideas and stimulations. Just look at the bill of fare served up in our movies, vaudeville and theatres, and you will hardly be able to deny that this is not the right kind of food, particularly for the youth… Theatre, art, literature, cinema, press, posters, and window displays must be cleansed of all manifestations of our rotting world and placed in the service of a moral, political, and cultural idea” (Mein Kampf, Chap. 10). 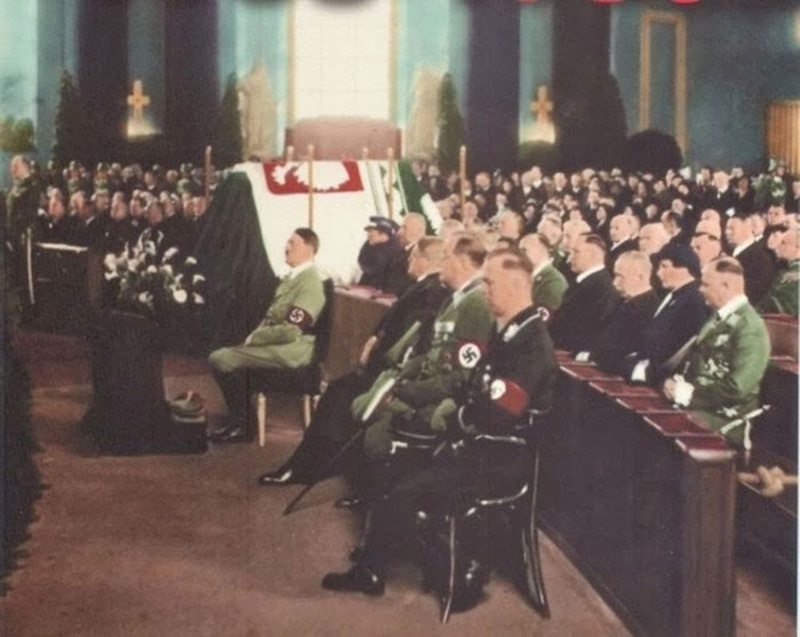 In a speech at the Sportpalast on October 24, 1933, Hitler said: “Without pledging ourselves to any particular Confession, we have restored to faith its pre-requisites because we were convinced that the people need and requires this faith. We have therefore undertaken the fight against the atheistic movement, and that not merely with a few theoretical declarations: we have stamped it out.” This statement and the following quotes about paganism, “Odinism” (a homosexual promotion of the Jewish Kaballah), and other old “Nordic” mythology (http://truthforgermans.com/?cat=71) show unequivocally that Adolf Hitler (and leaders of the NSDAP) promoted only Christianity. “On the contrary, it is entirely out of harmony with the spirit of the nation to keep harping on that far-off and forgotten nomenclature which belongs to the ancient Germanic times and does not awaken any distinct association in our age. This habit of borrowing words from the dead past tends to mislead the people into thinking that the external trappings of its vocabulary are the important feature of a movement. It is really a mischievous habit; but it is quite prevalent nowadays. At that time, and subsequently, I had to warn followers repeatedly against these wandering scholars who were peddling Germanic folk-lore and who never accomplished anything positive or practical, except to cultivate their own superabundant self-conceit. The new movement must guard itself against an influx of people whose only recommendation is their own statement that they have been fighting for these very same ideals during the last thirty or forty years. Now if somebody has fought for forty years to carry into effect what he calls an idea, and if these alleged efforts not only show no positive results but have not even been able to hinder the success of the opposing party, then the story of those forty years of futile effort furnishes sufficient proof for the incompetence of such a protagonist. People of that kind are specially dangerous because they do not want to participate in the movement as ordinary members. They talk rather of the leading positions which would be the only fitting posts for them, in view of their past work and also so that they might be enabled to carry on that work further. But woe to a young movement if the conduct of it should fall into the hands of such people. It is typical of such persons that they rant about ancient Teutonic heroes of the dim and distant ages, stone axes, battle spears and shields, whereas in reality they themselves are the woe-fullest poltroons imaginable. For those very same people who brandish Teutonic tin swords that have been fashioned carefully according to ancient models and wear padded bear-skins, with the horns of oxen mounted over their bearded faces, proclaim that all contemporary conflicts must be decided by the weapons of the mind alone. And thus they skedaddle when the first communist cudgel appears. Posterity will have little occasion to write a new epic on these heroic gladiators. I have seen too much of that kind of people not to feel a profound contempt for their miserable play-acting. To the masses of the nation they are just an object of ridicule; but the Jew finds it to his own interest to treat these folk-lore comedians with respect and to prefer them to real men who are fighting to establish a German State. And yet these comedians are extremely proud of themselves. Among those people there were some whose conduct can be explained by their innate stupidity and incompetence; but there are others who have a definite ulterior purpose in view. Often, it is difficult to distinguish between the two classes. The impression which I often get, especially of those so-called religious reformers whose creed is grounded on ancient Germanic customs, is that they are the missionaries and protégés of those forces which do not wish to see a national revival taking place in Germany. All their activities tend to turn the attention of the people away from the necessity of fighting together in a common cause against the common enemy, namely the Jew. Moreover, that kind of preaching induces the people to use up their energies, not in fighting for the common cause, but in absurd and ruinous religious controversies within their own ranks.” (Mein Kampf, Chap. 12). 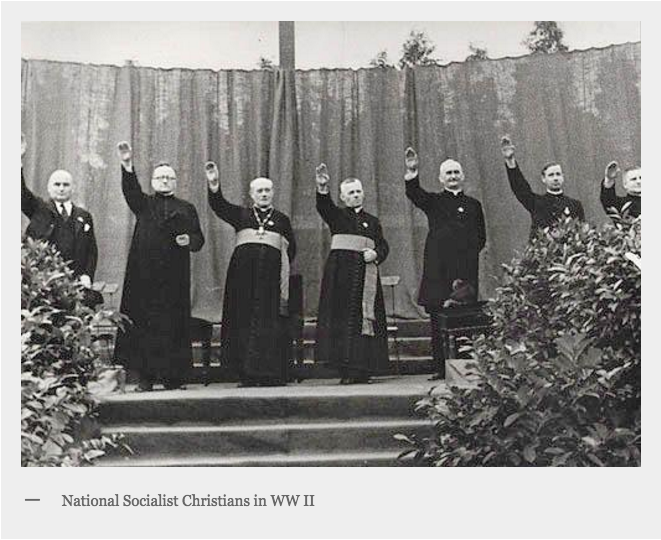 In a speech at Hamburg on August 17, 1934, Adolf Hitler said, “The National Socialist State professes its allegiance to positive Christianity” (bekennt sich zum positiven Christentum). “…we must pray to the Almighty not to refuse His blessing to this change and not to abandon our people in the times to come.” Hitler was here recalling a speech made by a priest after World War I (Mein Kampf, Chap. 7). “Even today I am not ashamed to say that, overpowered by stormy enthusiasm; I fell down on my knees and thanked Heaven from an overflowing heart for granting me the good fortune of being permitted to live at this time.” (Mein Kampf, Chap. 5). “A man does not die for something which he himself does not believe in” (Mein Kampf, Chap. 3). “I had so often sung ‘Deutschland über Alles’ and shouted ‘Heil’ at the top of my lungs, that it seemed to me almost a belated act of grace to be allowed to stand as a witness in the divine court of the Eternal Judge and proclaim the sincerity of this conviction” (Mein Kampf, Chap. 5). “Only in the steady and constant application of force lies the very first prerequisite for success. This persistence, however, can always and only arise from a definite spiritual conviction. Any violence which does not spring from a firm, spiritual base, will be wavering and uncertain” (Mein Kampf, Chap. 5). “Heaven will smile on us again” (Mein Kampf, Chap. 3). “For the political leader the religious doctrines and institutions of his people must always remain inviolable; or else he has no right to be in politics, but should become a reformer, if he has what it takes!” (Mein Kampf, Chap. 3). “The attack against dogmas as such, therefore, strongly resembles the struggle against the general legal foundations of a state, and, as the latter would end in a total anarchy of the state, the former would end in a worthless religious nihilism” (Mein Kampf, Chap. 10). “It may be that today gold has become the exclusive ruler of life, but the time will come when man will again bow down before a Higher God” (Mein Kampf, Vol. 2, Chap. 2). Julius Streicher was the ninth child of a Roman Catholic primary school teacher, and he also became a school teacher in Nuremberg. When Adolf Hitler was released from prison in December 1924, Streicher hailed Hitler’s return to politics as a “gift of God.” Streicher published a newspaper entitled Der Stürmer, in which he discussed Jewish ritual murder, Jewish aims to destroy Christianity, and the fact that Jesus was not a Jew. Chancellor Adolf Hitler said the following of Streicher: “The main fighter for the DSP [Deutsch-Sozialistische Partei or German Socialist Party], as I have said, was Julius Streicher, then a teacher in Nuremberg. At first he, too, had a holy conviction of the mission and the future of his movement” (Mein Kampf, Vol. 2, Chap. 7). Both of these quotes of course are in reference to John 8:44, in which Christ said to the mongrel Herodian Jews: “You are of your father the Diabolical One, and the lusts of your father you wish to do. That one was a murderer from the beginning, and he has not stood in the truth because there is no truth in him. When he speaks a lie, he speaks from his own, because he is a liar, and the father of it” (AST). Gerhard Kittel was considered one of the world’s foremost theologians both before and after the war. Even today, his Theological Dictionary of the New Testament is still widely used and respected. He willingly joined the National Socialist Party, feeling it his Christian duty. Even though his activities during the war were limited to teaching and serving on educational committees, he was arrested and imprisoned by the French for seventeen months after the war. He wrote a defence for himself and concluded that race-mixing was wrong, citing the examples of Ezra and Nehemiah. 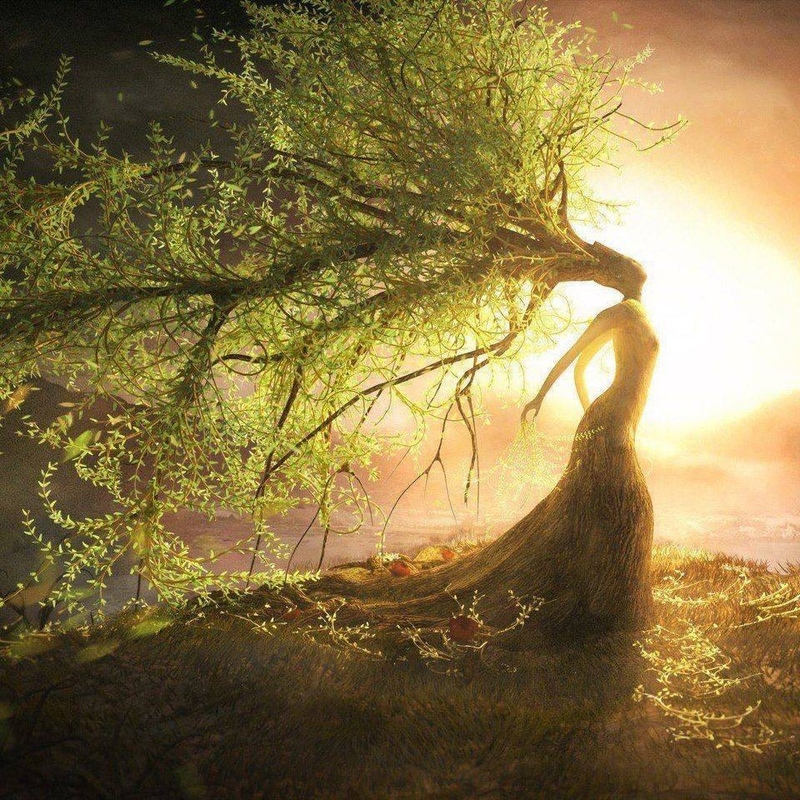 The misuse of the quotes of Alfred Rosenberg stands as the major reason why so many Anglo-Americans have been deceived into thinking that National Socialism represented Nordic pagan beliefs instead of Positive Christianity. Hitler chose Rosenberg for propaganda purposes. 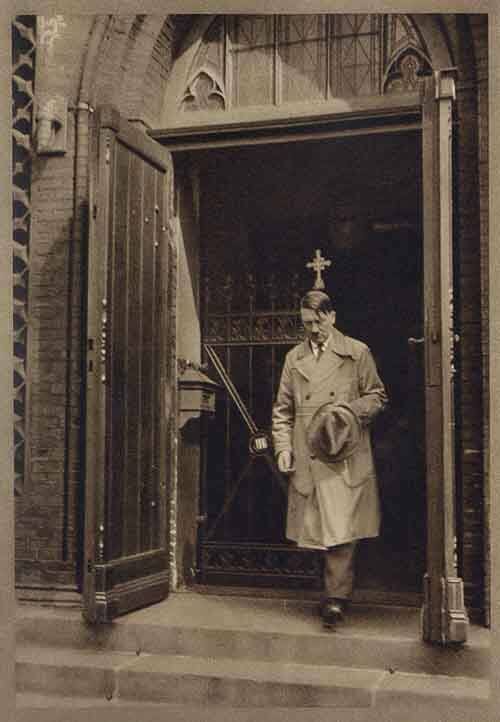 However, Adolf Hitler also established a Reich Christian Church for the future of Germany. Adolf Hitler did not believe in pagan cults and made his position very clear to Rosenberg. 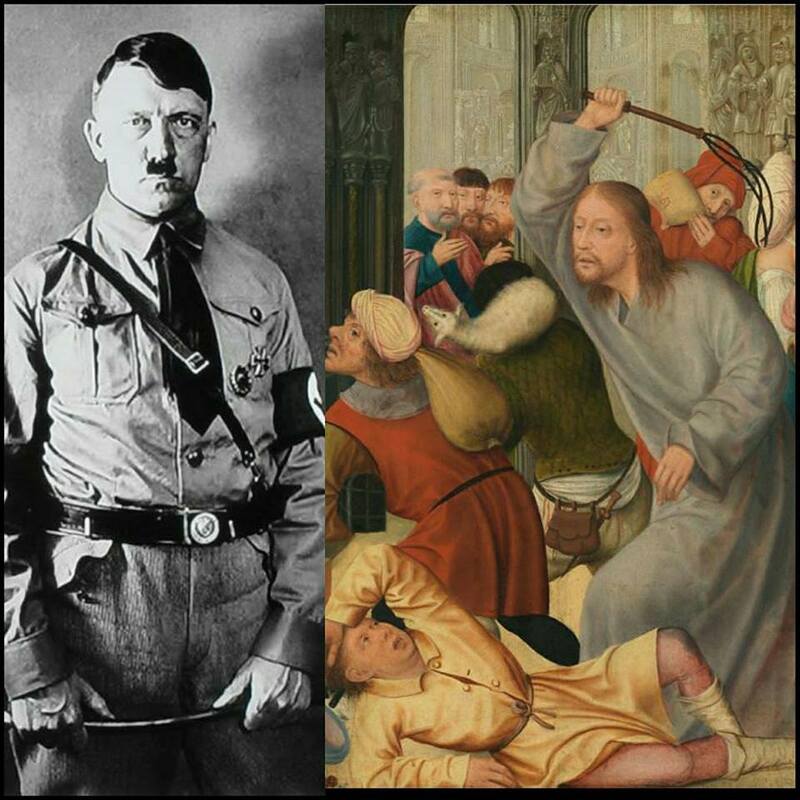 Rosenberg himself wrote that Jesus was Nordic, aggressive, courageous, “a man of true Germanic character,” a revolutionary who opposed the Jewish and Roman systems with sword in hand, bringing not peace but war (see Matthew 10:34-37). Rosenberg later went on to say that he favoured a “positive Christianity.” Any other statements that Rosenberg may have made or may have been reported to have made were not known to Hitler, for Rosenberg was careful to always assure Hitler that he, Rosenberg was a Christian. Among Adolf Hitler’s private papers was found after the war several handwritten sheets outlining a book he had intended to write which would have been entitled Die Germanische Revolution or The Germanic Revolution. He also conceived a book-cover which he sketched. It is clear from the outline that a great part of this book was to be committed to writing about the Bible, including an accurate account of the history recorded in the Old Testament and the true identity of the Israelites of the Old Testament as Adamic European white people and also a detailed study of the laws in the Bible against race-mixing and the historical consequences of the violation of this law. What follows are excerpts from these outlines which have been reproduced and translated in the book, Hitler’s Letters and Notes by Werner Maser. I. 2) Racial purity is a must. We have demonstrated in a variety of ways that the public record illustrates and proves the Christianity of Adolf Hitler and indeed of the true National Socialist movement. We have further shown that many popular historians are now admitting this fact. Yet, detractors to these facts often point to a number of alleged quotations of Adolf Hitler contained in so-called private records, most of which, after wide circulation and publicity, have been admitted or proven to be forgeries and spurious in nature. These sources are at best hearsay and are of such a dubious nature and have such questionable chains of transmission that none of them could ever be used as evidence in a court of law. On the other hand, in the public record, including Mein Kampf, published during Adolf Hitler’s lifetime, his large number of speeches, preserved on film, audio recordings, and newspaper accounts, the official publications and proclamations of the NSDAP party, and even letters which bear Hitler’s signature, we find nothing to contradict what we have stated so far. Next PostNext That Is Racist!